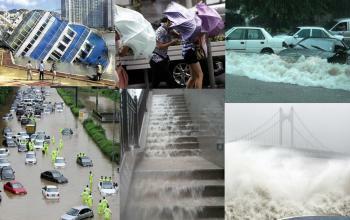 Twelve people have been killed and 10 are missing after a powerful typhoon pounded South Korea. Off the southern island of Jeju, the storm drove two Chinese fishing ships aground, sparking a dramatic rescue operation. Rescuers saved 12 people, six swam ashore, but 10 crew members are still missing and five bodies were recovered. In the southern county of Wanju, a 48-year-old man was killed by a shipping container flipped over by gale-force winds, the public administration ministry told the AFP news agency. Elsewhere an elderly woman was crushed to death when a church spire collapsed onto her house in the south-western city of Gwangju, while another elderly woman was blown off the roof of her home in the western county of Seocheon. The other deaths occurred in the south-western port of Mokpo, in Imsil county in North Jeolla province, in Yeongkwang county west of Gwangju, and in Buyeo city in South Chungcheong province. Over 200,000 homes have been left without power, although officials said central parts of the capital Seoul were largely unaffected. Weather officials said Typhoon Tembin is also threatening the Korean peninsula, moving at a speed of 16 kilometres an hour northward from Taiwan. n Wanju, North Jeolla Province, a security guard was killed after being hit with a container box blown by a gale of wind at an apartment complex parking lot at 11 a.m. Almost 200-thousand homes were left without power in Jeju Island, which sits on the direct path of the typhoon, Gwangju City, and North Jeolla Province. Twenty-one homes were destroyed or flooded, displacing dozens of people. More than 20 sections of roads and highways were closed to traffic across the nation. Hundreds of coastal ferries were stranded and international and domestic flights were grounded. Twenty national parks across the nation were also closed to visitors. A typhoon with winds of up to 170 kmh (106 mph) buffeted South Korea's west coast on Tuesday, leaving four dead and a dozen people missing after two Chinese fishing vessels capsized. Typhoon Bolaven was expected to eventually make landfall in flood ravaged North Korea late on Tuesday, hitting already damaged farmlands as the country struggles to feed its 24 million population. China's Meteorological Administration issued warnings of possible flooding in the coming days that could affect corn and soy crops in parts of its three northeastern provinces that produce about 30 percent of corn output and 40 percent of soy. Coast guard rescuers pulled 13 surviving Chinese fishermen from the vessels that capsized off the southern shore of the Jeju island, along with four dead, and were searching for 12 others still missing, the emergency services said. Seven apartment complexes in regions in South Jeolla province and Jeju Island were destroyed, while five apartment buildings in Jeju Island were inundated, forcing 15 people to evacuate, the NEMA said. Further property damages have been reported with four cars in Jeju's Seogwipo, the first area of the country struck by the typhoon, destroyed and a church steeple collapsed, the agency added. 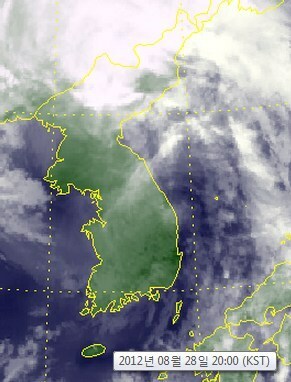 At 9 a.m., a previously issued typhoon advisory was upgraded to a typhoon warning in Seoul, home to about 10 million people, as the storm is forecast to pass along the port of Incheon, west of the capital city, between 2 p.m. and 3 p.m.
Two Chinese fishing boats with 34 crew members aboard capsized Tuesday in waters about 1.8 kilometers from South Korea's port of Hwasun in Jeju's Seogwipo, an official from the Chinese Consulate stationed on Jeju has confirmed. Three crew members have been rescued and 31 others went missing, the official said. The two fishing boats, "Yuejiangchengyu" No. 91104 and No. 91105, both from Weihai city of East China's Shandong province, capsized around 2:40 a.m. local time due to gale-force winds and high waves caused by Typhoon Bolaven, the official said. The Ulchi Freedom Guardian military exercise (ed note: the ones that make North Korea so angry) was put on hold Monday night, officials said. The largely computer-based exercise, is one of two major U.S.-South Korean war games held on the peninsula each year, with more than 30,000 troops from both countries involved this year. It was scheduled to run until Friday. According to the Joint Typhoon Warning Center (JTWC), Typhoon Bolaven is moving towards the Korean peninsula and is expected to make landfall on the Peninsula around the afternoon of August 27th and will continue to move north bringing heavy rain of 50-100 mm. and strong winds. A typhoon warning is in effect. Strong winds associated with typhoon may cause damage by blowing down trees, fences, TV antennas, etc. Property can be damaged by loose objects being blown around by these strong winds and by driving rains entering through joints around windows doors. In some areas tropical storm may cause local landslides, flooding and wave damage. Typhoons can cover areas of up to 500 miles (800 km) in diameter and generate winds up to 180 miles (290 km) an hour. The typhoon season in East Asia Pacific runs from May through October, with most activity from July to September. Typhoons that hit the region are often accompanied by damaging high tides. Persons living in areas close to the ocean are especially at risk. Landslides are also a serious concern during periods of heavy rain. A typhoon advisory (Jui) will be issued when the weather can cause damage. 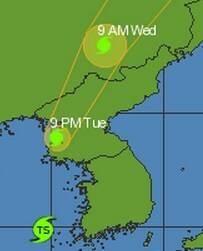 Typhoon warnings (kyungbo) will be issued when heavy widespread damage is expected due to the weather. For English-language information on the typhoon situation on the Korean peninsula, please refer to Armed Forces Network FM at 102.7, and/or TBS English FM 101.3. 1. Inspect the general condition of your quarters. Look for loose items, broken or cracked windows and doors and windows that will not latch securely. Request repairs for unsafe items and remove loose items from porches and patios. 2. Inspect your first aid kit to ensure it is complete. 3. Check to make sure you have sufficient candles, matches, lanterns, flashlights, batteries, etc. to provide adequate emergency lighting. 4. Close and lock all exterior doors, shutters and windows. 5. Check to see that you have a supply of non-perishable foodstuff and potable water set aside for an emergency. 6. Secure or move indoors all items outdoors such as toys, cookers, bicycles, balcony furniture, grills, plants, and anything moveable. 7. Keep your radio tuned to RADIO AFN (AM1440/FM102.7) for tropical storm announcements. 8. Set your freezer to the coldest temperature setting to minimize spoilage if the electric power is cut off. 9. Gather buckets, towels, rags and mops to absorb rainwater that may be blown into your quarters by the wind. 10. If water leaks in around the windows and doors, roll up rugs and place them on top of beds or tables to avoid water damage. 11. If the storm becomes very severe, move your family into a hallway or an area where there is the least exposure to external glass windows. Continue to monitor local radio and other media, and the National Weather Service to be aware of weather developments. Minor tropical storms can develop into hurricanes or typhoons very quickly, limiting the time available for a safe evacuation. Inform family and friends of your whereabouts and remain in close contact with your tour operator, hotel staff, transportation providers (airlines, cruise lines, etc. ), and local officials for evacuation instructions during a weather emergency. We strongly encourage U.S. citizens to enroll with the nearest U.S. embassy or consulate through the Department of State's Smart Traveler Enrollment Program (STEP) website. By enrolling, you will receive the Embassy's most recent security and safety updates during your trip. Enrollment also ensures that you can be reached during an emergency. While we will do our utmost to assist you in a crisis, be aware that local authorities bear primary responsibility for the welfare of people living or traveling in their jurisdictions. Additional information on hurricanes and storm preparedness can be found on the Department’s "Hurricane Season - Know Before You Go" webpage. You can get updated information on travel from the Department of State by calling 1-888-407-4747 within the United States and Canada or, from outside the United States and Canada, 1-202-501-4444.